Spice racks are great for freeing up countertop space, and most homeowners install one that hangs on the wall. However, for the homeowner who wants to store spices inside the wall cabinets, building a sliding spice rack is the perfect project. Minimal woodworking skills are all you need along with a set of full extension drawer slides. 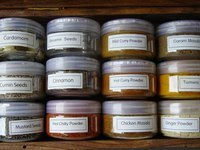 With full extension slides, the spice rack pulls all the way out of the cabinet, making it easier to reach the spices at the back of the rack. Place the 7-3/4 x 10 x 1/2-inch pieces (sides) on a worktable. Apply glue to the 10-inch edges of the 9 x 10 x 1/2-inch piece and the 9 x 10 x 3/4-inch piece. Secure them between the sides with the finish nails to create a rectangle measuring 7-3/4 x 10 inches. Clean excess glue with a damp cloth. The 3/4-inch piece is the bottom of the spice rack. Turn the spice rack so one of the open ends is facing up. Run a bead of glue on the exposed edges. Secure the 7-3/4 x 10 x 1/4-inch plywood to it with the box nails. Clean excess glue with a damp cloth. Put the 7 x 8-1/2-inch piece (bottom of the pull-out) on the worktable. Measure from one of the 8-1/2-inch edges and make marks at 2, 2-1/2, 4-1/2 and 5 inches. Place the framing square on the marks and draw lines across the material. Apply glue to one long edge of the 1-1/2 x 8-1/2-inch pieces (dividers). Secure the pieces between the lines drawn on the bottom of spice rack pull-out with the finish nails. Clean excess glue as before. Run a bead of glue on the ends of the 8-1/2-inch pieces (sides of the pull-out). Set them between the 8-inch pieces (front and back) and secure them with the finish nails. Clean excess glue. This is the pull-out frame. Spread glue on the four edges of the bottom of the pull-out with your finger. Slip it inside the pull-out frame and secure it with the finish nails. Install the full extension drawer slides according to manufacturer’s instructions. How Do I Build a Livestock Rack for My Truck?